A single car parking space in downtown Auckland has sold for $265,000. 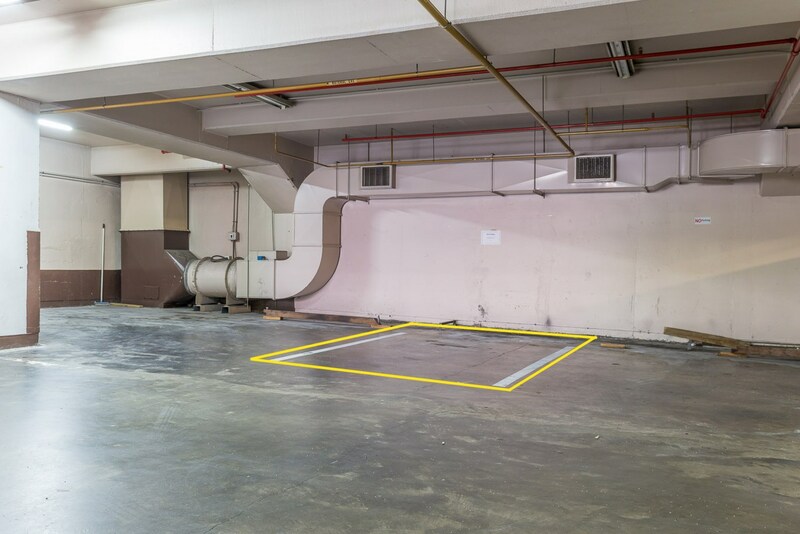 The freehold car park (pictured) was located in the basement of the Quay Regency apartment building at 148 Quay Street, which is across the road from the Ferry Building and around the corner from the Britomart train station. It was put up for auction at this week's at Ray White City Apartments' regular apartment auction. There were several bidders in the room for the property and the bidding started at $70,000 and then proceeded briskly in $10,000 increments to $130,000. One bidder then upped the ante considerably with a bid of $180,000. That caused bidding to pause, but only for a moment and then it resumed briskly until it sold under the hammer for $265,000. According to the Real Estate Institute of New Zealand, that is exactly the same price as median-priced home in Southland. The property was marketed by Ray White's Daniel Horrobin and Damian Piggin, and Piggin said it was the car park's highly sought after location that saw it fetch such a high price. Most of the potential buyers were people living and/or working in the area, he said. Ray White's promotional material for the space said the lack of supply and increased demand for car parking in the area meant the chance of a similar space coming up for sale anytime soon was "extremely unlikely." Unfortunately the car park was the highlight of this week's apartment auctions. A brand new, two bedroom apartment in the Aria building on Vinegar Lane in Ponsonby received multiple bids, but none was high enough to get a sale across the line and it was passed in. And a unit in the Zest building on Nelson Street, which has been a favourite with investors for several years, did not receive any bids and was also passed in. Things were also quiet down at Barfoot & Thompson's regular apartment auction, where a commercial property and five apartments were on offer. The commercial unit was a house on College Hill that had been converted to offices. It received no bids and was passed in. The auction of one of the apartments was postponed and of the remaining four, two were sold under the hammer, one had a single bidder and was passed in and another received no bids. Details of all the properties offered at both auctions, and the prices of those that sold, are available on our Residential Auction Results page. Barfoot's might as well start reporting on the food at AGMs for public companies. Must be all the capital flows from China. Not sure why the Chinese get dragged in all the time. Chinese get blamed until the LVR was introduced, which did not slow down the price rise (except for a little while). Then the Chinese capital control kicks in, and property prices continued to rise slowly. Obviously all that controls and measures implemented over the last few years disproves the assumption that it was the Chinese that drove up the price (more likely the Brits and Oz investors!). Yet even when proven wrong I do not expect that Chinese (who got all the blame unjustly) will ever get any apology. Not far off when a stand only loo in the central city will be sold for 150k or so ? So a spot for a self contained van then, secure entry and hopefully low body corp fees... hmm I wonder how the body corp would be worked out on this. So based on 265k that's 1.35% gross yield. The new owner is obviously expecting big capital gain to make it worthwhile. Or a big lift in Car park rents to increase the cash flow. That means the price has a 1.3% gross rental yield on this car park. This is 2.9x the median household income in Auckland - a reasonable valuation ratio for a house for an entire household to live in. This is a somewhat ridiculous valuation for a single carpark where you can't even pitch a tent for 3 people to sleep in. The space is smaller than a living room. Assuming a car park size of 2.4m x 4.8m = 11.52 sq m. Then using the $265,000 price, this is equivalent to a price of $93,091,832 per acre of land or $230,034,722 per hectare. Maybe their going to put a caravan in there and rent it out as a 2 bedroom option...? Caravan? We don't have those now. We have "tiny" houses. "For $265,000 you could by a car park in downtown Auckland or a house at the median price in Southland"
I wonder if the future will have alot of people working remotely and not driving into the city. At the moment you are correct, lots more buildings going up, less parking, more resident only parking, pay and display everywhere and time limited parking are all making car parks like this more valuable. Auckland Transport planning idiocy means there is good value in car parks like this. A big faction of Auckland Transport has planned car dominated living space to cover vast areas of Auckland creating some world leading sprawl. Large dormitory exurbs outside of the reach of public transport are to swell eightfold over the next 20 years. Another faction of Auckland Transport has planned intensive urban living, where cars and car parking will not be required or even permitted. The ratepayers are funding both factions and it is all going as well as can be expected. not just inner city for the "no car parks are necessary brigade - acquaintance depressed to be living next to a development in East Auckland where 5 car parks only, for 15 units. Even worse as if just one household needs trades or medical services then they are further cut down to only 3 carparks for 15 units. In central city they tow nurses vehicles quick when they visit patients. It is not like it is life saving right. It takes 4-6 months to get the AT total mobility disability card renewed, for a permanent disability (in the meantime having any transport access to medical appointments is cut). Not to mention AT removing disabled access in large swathes. They are like Wellington with their dislike of the disabled in the city. Even Sydney is a disability dream compared to most NZ, left me in tears and I never would cry. AT plan to sell off and build over hundreds of carparks making access for many impossible. It is their way. Take bribes and underhand payments for poor work, fast track consent damage, and sell off everything they can to private developers for another cut. They rightfully deserve the typical 2 word 2 finger greeting,... and that would be the cordial greeting. They'll probably subdivide it and build apartments. Real luxury for a Ford Anglia or Vauxhall Viva. And any decent Hillman Imp would aspire to a resting place like this one. Quite possibly. Maybe his/her costs are subsidised by the Gold Card free ferry trips? I wouldn't pay this for a park, but I can see the value to some given the location. Wilsons won't be able to ratchet the lease costs or even deny you a space and it's a location unaffected by the CRL madness. I imagine this particular auction turned into a bidding contest between some big spenders. Not so long ago, one could buy a respectable 2-beddie villa in an Auckland inner-city suburb for that sort of money. $265,000 still buys an adequate bedsitter in Wellington. I guess one could buy a camper van and try living there?? By not long ago, you mean the previous millenium? Is it subdivisible and in the DGZ? As TTP says park up a van, sweet. So weatherboard homes 4 mill, parking spaces 260K, nothing is wrong in Auckland sounds pretty reasonable to me. Everyone in Auckland must be millionaires, people must work for fun. This carpark is a microcosm of Auckland costs and why apartments don't get built there in large numbers. Step 1. - make the central city incredibly costly. Step 2. - viciously costly. Step 3. - really, really high cost. Step 4. - make it permissibly allowable to build apartments. Step 5. - wonder why apartments aren't built. Step 6. - try to make it even more costly. Repeat. I had the temerity to build a few around 7 years ago. Never, ever, ever again. At the end of the project, Auckland Transport even wanted to take part of my property and lease it back to me! Fu**ing ar**holes councils. Especially planners. Davo, yes I learned earlier on to minimise council involvement in anything you do, as much as possible. Planning?? There are no brainer projects they could have done years ago, train lines to the airport being one of them. Just B useless. So anyway, I thought property prices were falling? Any time there's an article (which is about 3 times a week) on here about slow sales at auctions, there's about 150 comments all mostly saying the crash is here, the crash is here. But when we see a high sales price, hardly any comments. Doesn't fit with most readers of this blog's opinions. Don't get me wrong, I think property prices are stupidly high in Auckland, and a crash might well be imminent. I'd be somewhat happy if a crash did happen (apart from the poor over leveraged ones losing their houses). But it hasn't happened yet, and may not. And if people are paying $265k for a car park, there's obviously still a fair bit of cash slopping around out there. Agree, for all the opinion, seems there is still money around to buy these sorts of investments. If so property is good for the near future.